No surprise: the future is an ugly, lonely place. Humanity has long moved away from physical activity and interaction, passing those tasks onto an army of clones who after years of servitude, went on to overthrow their masters and took refuge underground. In the 1,200 years since abandoning humanity, the clones have continued to evolve whereas humanity has fallen into further disarray until finally, it seems the human race is on the brink of collapse. In a final effort to keep themselves alive, the humans send an explorer underground. His mission is to track down a subterranean creature which the scientists believe holds the key to keeping humanity alive and so our explorer travels underground and embarks on the adventure of a lifetime. Junk Head sounds like a must-see apocalyptic vision and it truly is an outstanding new entry into the sub-genre; a wholly new and unique concept from the mind of one man: writer, director and puppeteer Takahide Hori. Yes, puppeteer. 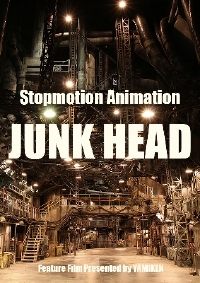 You see, Junk Head is a stop-motion animated feature made independently by Hori and it is glorious to behold. Though Junk Head borrows story ideas from various places and the movie is quite clearly a hero's adventure, it' none the less a joy to watch. There are the unique character designs, from the current state of humans to the clones who call the subterranean depths home, which are completely new and unique; what I imagine a Clive Barker design might look like if it passed through Laika. Our hero is a likeable character who finds himself stumbling through an unknown world where nothing looks familiar or reacts the way he expects it to. Along the way, he meets friends and foes and creatures who simply don't know what to do with him but in the end, they come together to help "God" find what he's searching for. There's a Wizard of Oz and Charlie and the Chocolate Factory feel to Junk Head; a sense of weird awe at how the movie feels both creepy and light, in part because Hori makes it so. He doesn't shy away from brutality with strange creatures, graphic deaths and oodles of blood but it's also a lot of fun and Hori takes every opportunity for jokes, both visual and otherwise. A brilliant concept and unique world building are only the tip of what Junk Head has to offer. For all its nastiness, it's ultimately a great story of perseverance, acceptance and teamwork. Not only is Junk Head one of the great discoveries of the year, it also marks the arrival of a bold new vision. I can't wait to see what Hori will deliver next. Junk Head has been playing festivals since its international premiere at Fantasia earlier this year. If you are in Vancouver, you can catch a screening at the Rio Grind Film Festival on Saturday, November 18.
this was the initial release.. about 1/2 of the project i believe? Actually 30mins Junk Head on youtube is 1/3 of the feature ver. And he started Kickstarter to collect money to make "BUBBLE HEADS", which is the day before story of "JUNK HEAD". Kickstarter will be colsed in Nov 25th. If he doesn't success, he might quite to make a stopmotion.